The World’s End Estate was built at the end of the great boom in high-rise housing in the sixties. And it got a bad press. Today it stands as one of the most impressive of the high-rise, high density developments of its time and maybe one of the most likeable. The scheme was conceived by the Metropolitan Borough of Chelsea in 1963 who commissioned its original design from the architect Eric Lyons. It was seen through, after 1965, by the Royal Borough of Kensington and Chelsea. Both, as befits, this generally affluent area, were Conservative-controlled but this at a time when the local state still exercised responsibility for the proper housing of working people. When Chelsea announced its plan, it was proclaimed ‘village style living in the heart of London’. (3) If so, it was a very densely-settled village. Lyons’ plans projected a housing density of 250 people per acre. This was far above the London County Council’s limit of 136 people per acre and the LCC rejected the plan. 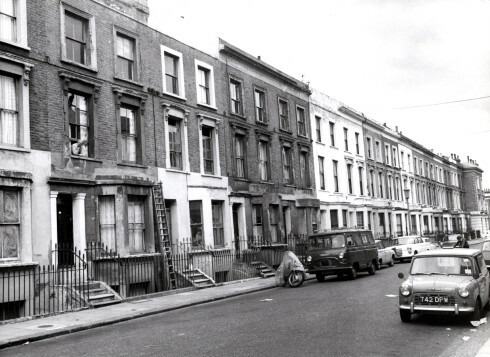 Kensington and Chelsea refused to back down – a lower density, they argued, could not rehouse all those cleared from the 11 acres of run-down terraced housing it replaced. After a public enquiry, and vindicated by the high quality of the proposed scheme, ministerial approval for a 750 unit development was granted in 1966. A £5.6m tender was accepted in 1969 and construction began the same year. The first residents moved in in 1975 and the scheme as a whole was completed in 1977. Building had been slowed by a twelve-week national building strike in 1972 – fought against ‘the lump’ (the casual employment of subcontracted construction workers without benefits or employment rights) but complicated here by labour shortages and the difficulty of agreeing wage rates. The contractors, Cubitts, withdrew from the contract – complaining it had become financially punitive. Bovis took over with a tender £1.1m higher. And the finished scheme – with all ancillary works – came in at £15m. It was alleged that this equated to an economic cost rent per flat of £2600 a year though actual rents (exclusive of rates and central heating) were set at between £8 and £20 a week. But the Estate itself deserves our attention. It comprises those 750 homes and a population of around 2500 living in seven high-rise tower blocks of between 18 and 21 storeys joined by nine four-storey walkway blocks in a figure of eight. 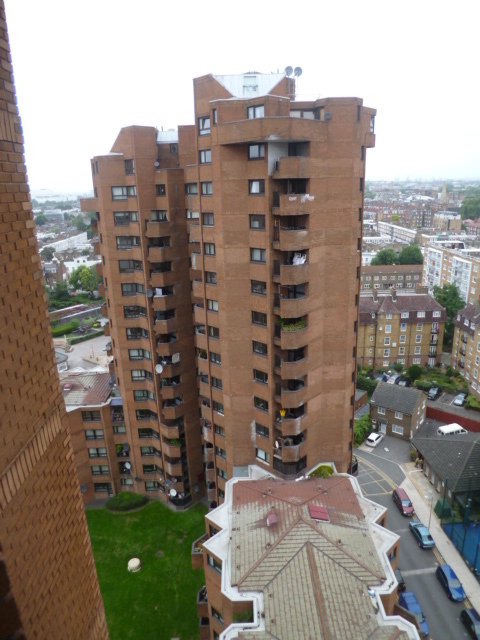 The high-rise blocks contain about half the Estate’s flats and all its two-bed dwellings – typically four flats to a floor with three-bedroom duplex units located at the top of each. 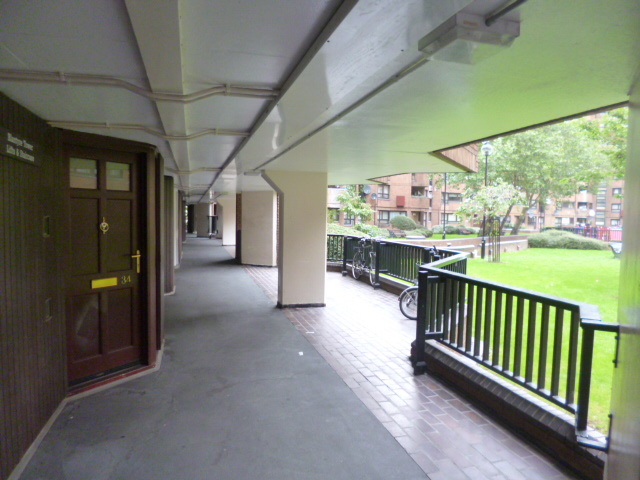 The rest of the flats – a mix of bedsits, one-bed, three-bed and four-bed units – are clustered along the low-rise walkways. The dry descriptive detail does scant justice to the Estate’s appearance. 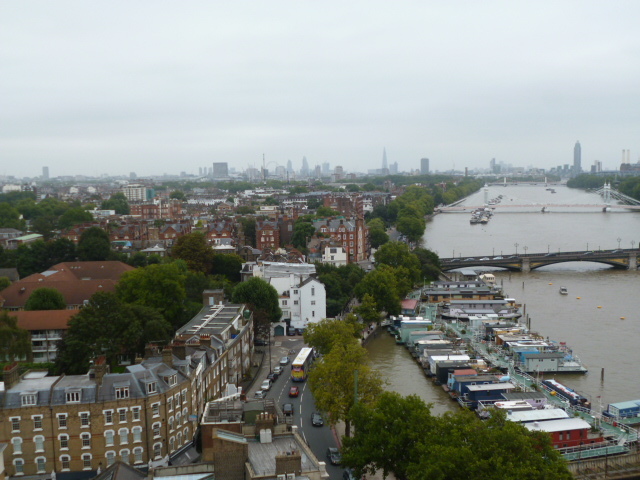 There’s the Thames-side setting, of course, and the spectacular views from the higher flats. Then there’s the interestingly irregular lay-out and the polygonal design of the tower blocks. What we have at World’s End is the extraordinary efflorescence at the summits of the towers, where the flats are cantilevered out and piled up into an irregular skyline of great romantic appeal. And the Estate as a whole is finished with a brown-brick cladding, concealing its pre-cast concrete construction, which adds a warmth to the construction and, so they say, an echo of the terraced housing it replaced. the internal courts have an air, not of modern domesticity, but of castle yards…No longer visibly a ‘home’ the dwelling is sunk within an abstract super-image. This may be impressive but to the home-maker it is not the point…Let us hope that it marks the end of this particular road. This built on the emerging theory of ‘defensible space’, critical of open-access high-rise development and the anti-social behaviour which allegedly followed, pioneered by US architect Oscar Newman and popularised in the following decade by Alice Coleman. If there was any validity to those early criticisms then, they seem far less justified now. The Estate, unusually perhaps, has aged well. It seems both an attractive landmark and a good place to live – popular, by most accounts, with its residents. Those ‘castle yards’ look green and pleasant. Those residents have evolved. Many have grown older with the Estate. There are fewer youngsters now – just 350 out of population of 2500 – and it’s a quiet place to live. Patterns of occupancy have evolved too. As a Conservative authority, Kensington and Chelsea was happy to sell off its properties before Right to Buy but, with the added impact of the latter, some 178 are now leasehold. Of these, 70 per cent are owner-occupied, most by their original tenants; the rest are sublet. Still, 550 homes of the 750 – almost three quarters of the total – are rented from the council. 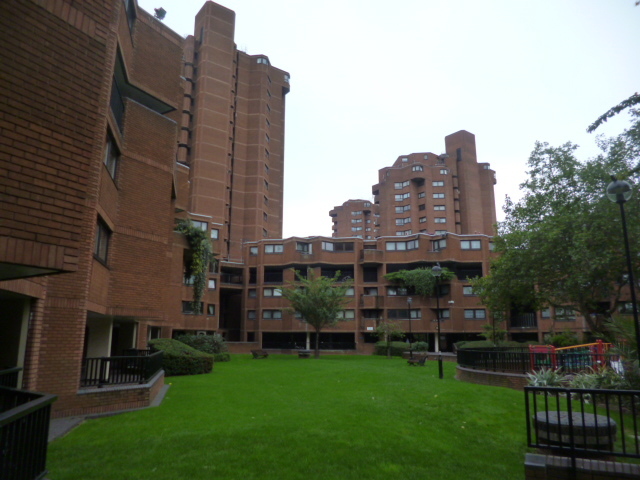 While the Council retains the freehold, the Estate itself is managed by the Kensington and Chelsea Tenants Management Organisation. There’s also a Residents’ Association with about 200 members. The Estate isn’t listed yet, generally to the relief of residents as it means necessary renovations can be carried out more cheaply – though it also allowed the Council to fit some very out-of-keeping front doors. 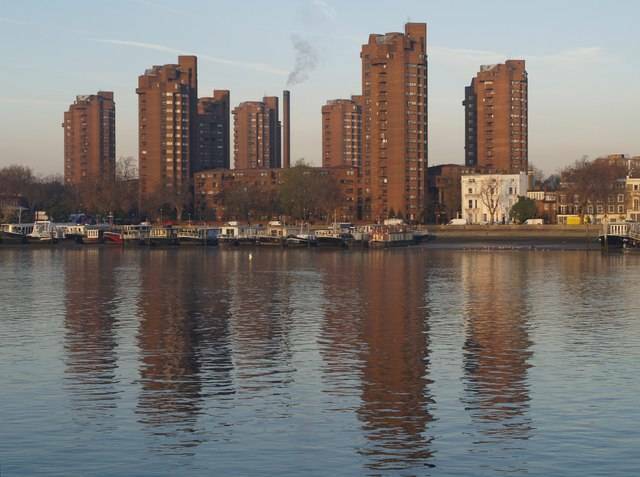 Despite that, take a look at the World’s End Estate, by the Thames at the unfashionable end of King’s Road. It’s one of the most successful high-rise, high density council housing schemes of its era. 35 years on however and despite many changes by the Council, both wise and unwise, the core design envisioned by Eric Lyons remains in place: seven tower blocks interlinked by ‘streets in the sky’ providing 750 ample-sized and comfortable homes with access to decent local facilities to over 2500 residents, many of whom have come to love and cherish the estate. (10) Factsheet for London Open House 2013 available from worlds-end.org.uk – the website of the World’s End Residents’ Association. 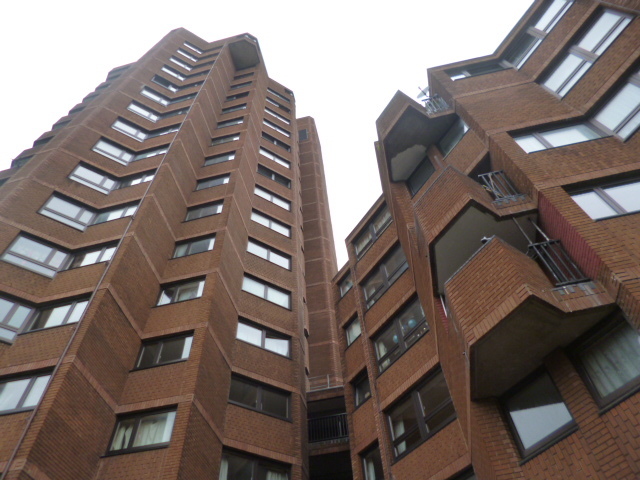 Read the Love London Council Housing post At the World’s End for some better pictures and more opinions on the Estate. This is great stuff. I talk repeatedly in lectures about how wrong Alice Coleman was with her critque, using often the Barbican as an example. 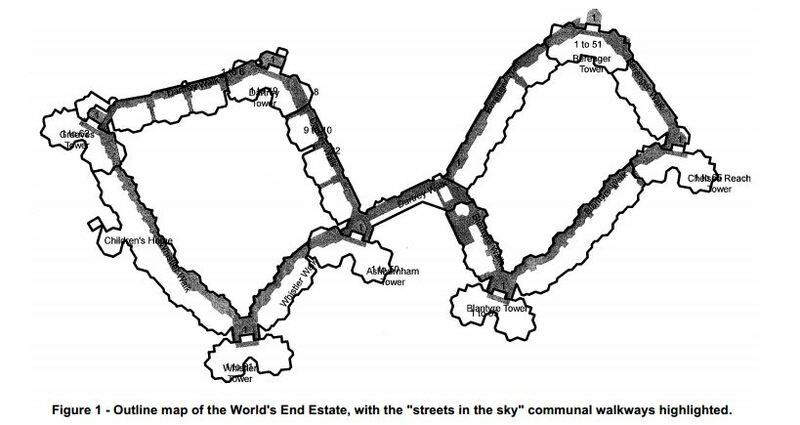 World’s End is far better example of municipal housing that worked. I’ll be using it in future to make the point. Thanks for drawing it to my attention on your wonderful blog. Shame they clad it in brick though the concrete would have been much more to my taste! But not very Kensington & Chelsea though. Thanks for your comments – glad to be of service! Really interesting and so different from the approach today when large scale housing projects are being planned where profit is the main driver rather than building decent homes for everyone. Nice post, thank you. I lived in one of the towers for the first four years of my life in the early 80s and have fond memories of it. I only lived on the fourth floor though so could not take advantage of the spectacular views the higher flats commanded. I was also more concerned with my “he-man” toys and Danger Mouse role-plays at that age though too. My family moved only a stone’s throw away to Lots Road for the following 12 years so the shadow of the towers were a constant growing up. I haven’t always liked the estate as a whole but have grown to love it as I’ve grown older as I still drive around London and see it on a frequent enough basis. Thanks for your comment. Glad you enjoyed the post and happy that it brought back some memories. I have had a flat in worlds end for nearly 30 years. I was previously living on one of the boats and met a lady who together with her 3 boys and wonderful husband frequented Cremorne Gardens and the railway sidings where the Chelsea Harbour was later built, and where we took our children to watch birds and wildlife and collect wild flowers and blackberries. We also took the children down to the riverside where they spent hours when tide was out pottering around. They lived on the 18 th floor in one of the towers and we were invited to tea. Often! The home had little furniture. There were 2 or 3 of platforms on which the kitchen table enabled one to sit comfortably watching the views to the west. They had a superb telescope and the children identified stars at night, boats and raptors by day! The boys had one bedroom. There were NO beds. But in the store room, replete with excellent shelving were brilliant bed rolls. The children could sleep anywhere they wished. They had fantastic play things. Hiltibolts in the concrete ceilings enabled them to hang rope swings, rope bridges, hammocks with which to create settings for endless indoor adventures. There was NO TV. The parents had the other bedroom. It shared balcony with the sitting room. On the balcony they had built a green house. In it was a truly tropical paradise. They raised rare butterflies and had a mini worm farm and grew fruit on vines. This bed room also had a platform for the mattress and resulting extra space underneath. The room was full of books and learning materials. And quiet. A perfect place for study. Their father was a very severe epileptic and neither parent could go out to work. However they had the most brilliantly educated boys. Because of very limited budget they were superbly conscientious of food shopping and preparation. Home made everything. No wastage. Ever. Eventually I moved into the estate. I met with an extraordinary range of people. There were many tragic stories, and many to make one laugh. Years ago there were kids on stairwells dealing crack, drunken domestic violence was rampant and criminals were many. And there were many many dignified folk too. One large extended family had flats all over the estate. They had lived in that 11acres since the Doomsday Book was written. Privatization has been good for the estate in some ways but sadly now there are so many passers through, 99% of them barely speak English and it erodes the local community feel as they are reluctant to participate. And of course property speculators tear out the substance of village life…..